"The trouble in Eastern North Carolina, which has historically been a problem, is that the housing stock down there is so bad," said one regional expert. 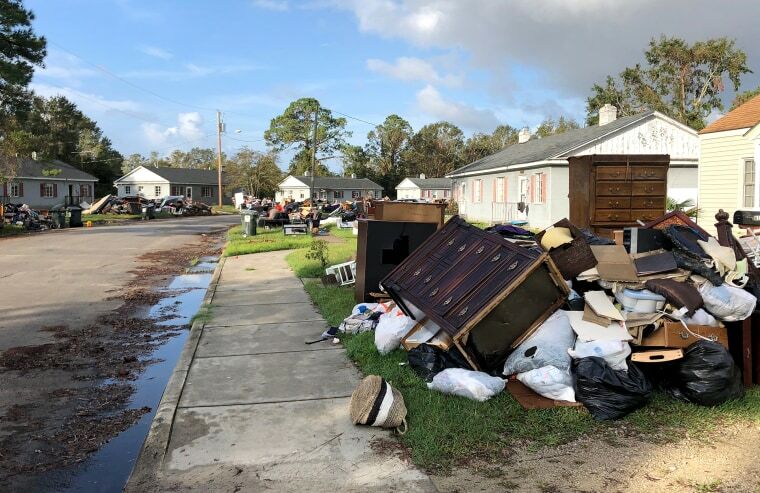 NEW BERN, N.C. — Nearly two weeks ago, when Hurricane Florence pummeled the Carolinas, the storm destroyed the trailer Army veteran Paganda Howard lived in with her husband and two daughters. Now she's like many others in this historic colonial town, forced to live with family in cramped and outright hazardous conditions. “When the flood came, it just showed you [the landlord] who wasn’t coming to repair anything or that the mold was already in the house ... The storm just made it worse,” Howard said. It was under those circumstances that more than 1,200 people fled their homes for shelters after a mandatory evacuation was declared in the area ahead of Hurricane Florence’s arrival in New Bern. "The trouble in Eastern North Carolina, which has historically been a problem, is that the housing stock down there is so bad,” said Bill Rowe, the general counsel and deputy director of advocacy at North Carolina Justice Center. “It’s old or it’s been damaged or ruined by things like storms, and there isn’t a lot of new housing being built." Numerous residents whose homes had been damaged or destroyed told NBC News that they did not go to the shelters because they heard that many were overcrowded and unsanitary. Multiple people alleged that black mold had been discovered in Trent Park Elementary School, which served as a shelter for about 50 people until it was closed Wednesday. New Bern Mayor Dana Outlaw, the American Red Cross and Craven County officials all said they had not seen any evidence of black mold inside any of the shelters, however. Most residents in need are now using the West New Bern Recreation Center as a new shelter so that the Craven County School District can work to reopen the schools that were damaged in the storm. About 200 people currently remain at the recreation center or another shelter also run by theAmerican Red Cross, Outlaw said. “A lot of them were able to go back home,” Outlaw said of the 1,200 residents who used shelters, but he noted that 700 homes still could not be connected to the city’s power because water damage was so bad that it could be a fire hazard. “Short term, we do have a problem, and we're going to address it,” said the mayor, who has worked as a real estate appraiser for the past 40 years. “But we have to work with [the Federal Emergency Management Agency]. The amount of money that it's going to take to restore New Bern, North Carolina, is going to require FEMA money. It'd be crazy for us to go out and spend New Bern money, and then ask for FEMA reimbursement and they don't reimburse us." FEMA did not respond to multiple requests for comment on what its temporary-housing timeline for New Bern and other storm-damaged communities currently looks like. Outlaw said he only would characterize New Bern as facing a “housing shortage because we’ve had a hurricane," but not all city officials agreed with that assessment. Alderwoman Sabrina Bengel said the city has long struggled to provide affordable housing to its residents, particularly to its low-income population. She said that she hopes that the city can use this storm as an opportunity to help the 19.1 percent of its population who live in poverty. Bengel said because they have to wait for FEMA to work out a plan, the city can only offer transitional housing assistance in the form of money for a hotel or apartment. But both are nearly impossible to acquire in New Bern at the moment, with some hotels booked through mid-October. Cantwell isn’t alone in that experience. Florence did not discriminate, and also affected the wealthy sections of New Bern. Anne Schout, who worked as a chemist at the Department of Agriculture until she retired, lived in the historic district in the same 8,000-square-foot mansion once owned by the founder of Pepsi — a beverage first born in one of the shops here in 1893. But these days, Schout is instead staying at a charming bed and breakfast because the flooding also drove her family from their home. She said that circumstances are dire, but that her family is very lucky. Though neither Schout nor Cantwell can return to their homes yet, Cantwell's circumstances mean it will take her longer to get back to normal. As of now, the floors and walls of Cantwell's home, where she'd lived in since 1975, are still inundated with mold. She said a contractor told her it would be months until he could work on her home — and that prices would be high.